SUMMARY: Good, good, everything's good, except there's no gas in my car. The drive down to Prunedale was lovely, only a slight slowdown in one place. The weather there was mild and sunny with just a tinge of evening chill creeping in, perfect for agility. We started the Pairs Relay class right on time. Boost ran like a real Masters dog--no runouts or even the hint of a refusal, did a hard entry to the weaves and stayed in all the way through. Knocked one bar, but it was a normal sort of bar knock, not a frantic must-get-through-it kind. Just lovely! We had a couple of wide-ish turns where I didn't handle really well but they weren't awful ones at all, and our partner was clean and we had a combined runtime of just over 39 seconds where the fastest couple of teams were in the 35 range, so that was a very good time indeed, and we Qed easily. Tika also had a lovely run, and even though her partner had a runout and another 5-point fault, our combined time was plenty good enough for a Q also. As we finished, the fog just started sending tentative tendrils across the fields, so tomorrow should start very cool, a nice contrast to the heat here in San Jose. The drive home went mostly swimmingly; just one post-accident clean-up that slowed us probably no more than 10 minutes, maybe only 5. 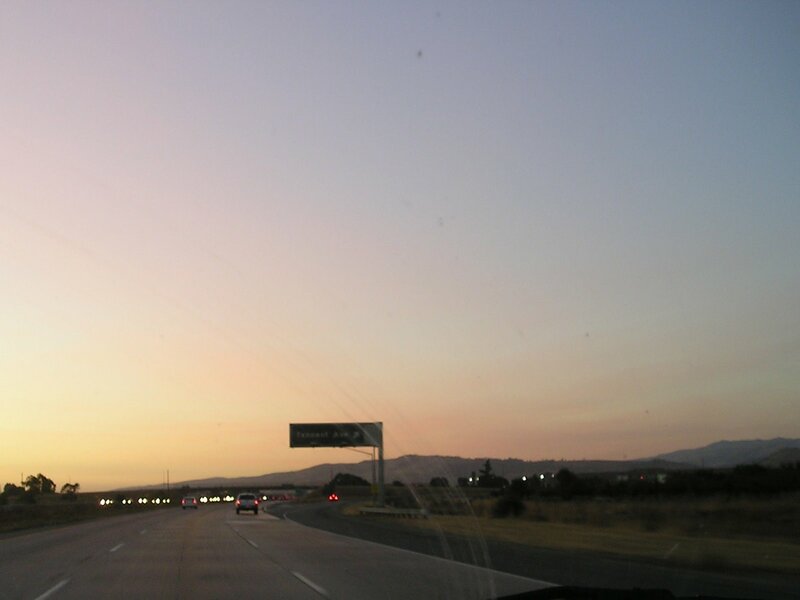 We drove home into a pleasing although pale pink sunset and were home before complete dark. The van is low on gas. And--my gas station was out of gas! How rude is that! I can get to the trial in the morning, but home again would be tight. Oh, well, it was a minor thing in a lovely afternoon.